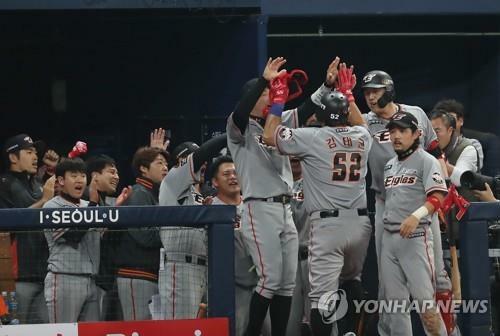 SEOUL, Oct. 22 (Yonhap) — With one swing of the bat, Hanwha Eages’ veteran slugger Kim Tae-kyun brought his club back from the brink of postseason elimination on Monday. 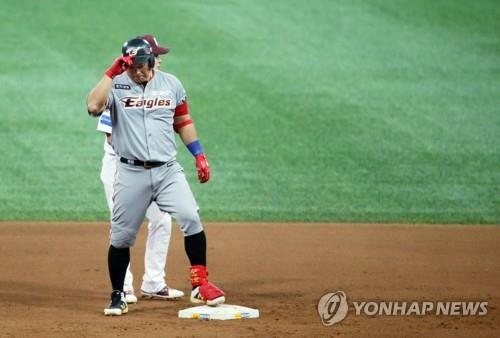 His RBI double in the top of the ninth against the Nexen Heroes didn’t just lift the Eagles to a 4-3 win in Game 3 of the first-round postseason series in the Korea Baseball Organization (KBO). It also provided a measure of redemption for the 36-year-old face of the franchise coming off his worst regular season since 2002. Kim was benched at the start of the first two games of this series, both resulting in Eagles’ losses. With the team’s back against the wall in the best-of-five series, manager Han Yong-duk turned to the veteran in the must-win game at Gocheok Sky Dome in Seoul on Monday. Batting fifth as designated hitter, Kim lined a single in his first at-bat in the second, and later scored a run in the team’s two-run frame. But it was merely a prelude to his ninth-inning heroics. With the score tied at 3-3, the Eagles had just dodged a bullet in the bottom eighth when closer Jung Woo-ram escaped a one-out jam with two men on by getting a double play. In the top ninth, Jared Hoying led off with a single. The Eagles were so desperate for a run that cleanup Lee Sung-yul, he of 34 homers in the regular season, tried to lay down a sacrifice bunt. He failed to execute the play, and instead hit a grounder to third baseman Kim Min-sung, who could only get the force at second base. With Kim, who bats right-handed, coming up, the Heroes pulled southpaw Oh Ju-won and summoned right-hander Lee Bo-geun from the pen. Kim greeted him with a line drive double to right-center field on the first pitch fastball, and Lee ran all the way from first to home to make it 4-3 Eagles. Kim was lifted for a pinch runner and was mobbed by his teammates in the dugout. Most of the sellout crowd of 16,300 were Eagles supporters, and “Kim Tae-kyun!” chants rained down for several minutes. Kim has spent his entire 16-season KBO career with the Eagles, with a two-year stint in Japan thrown in between. He is a career .325 hitter with 303 home runs but was limited to 73 games and 10 home runs this year, his fewest since hitting seven in 2002. Kim was no longer a fixture in the starting lineup by the time the postseason rolled around. He struck out as a pinch hitter in Game 1, and didn’t even get into action in Game 2. But Kim came through just when the Eagles needed him, and they’ll live to see another day of postseason baseball. Kim, one of few remaining players from the Eagles’ last postseason in 2007, said he didn’t know how much he missed October baseball until he came back.